Click on infographic to download. This week we are discussing child seat safety. Recently, the Today show did a story on car seats with children wearing jackets. As a child passenger safety advocate, I was very interested in the story and the conclusions of the reporter. Take a minute and watch this video clip, and although it may appear graphic, not in a gruesome way, it will provide an understanding of what happens to a child who is not properly restrained during a collision. What the video shows is an improperly secured child in a 25 mph collision. If you watch the video closely, you will notice the shoulder harness straps are very loose and the harness retainer clip is near the child’s stomach. This is accurate with regard to how some children are secured in a child restraint. 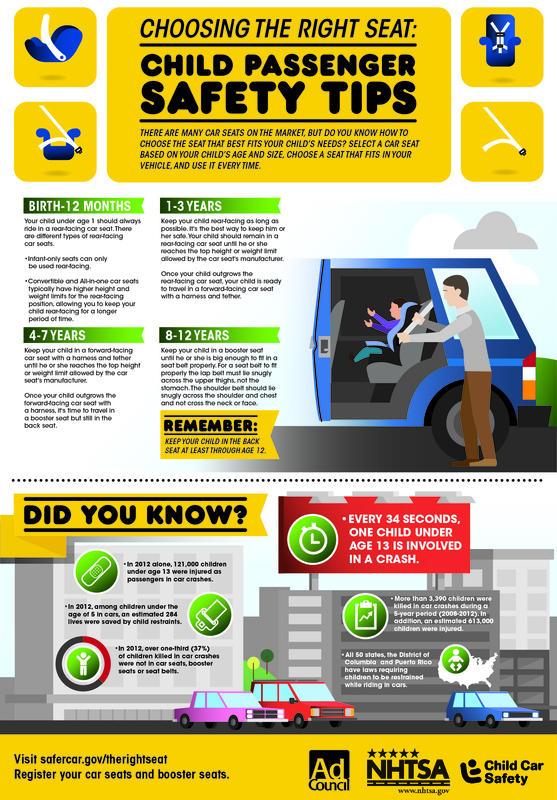 Nationally, 75 percent of all child restraints are improperly used. Loose harness straps are one example of improper use. Obviously we get concerned when we see something like this and hope we aren’t endangering our own children. The seatbelt or LATCH (Lower Anchors and Tethers for Children) system MUST lock the seat in place. There should be no more than one inch of movement in any direction. The harness straps (those around your child) must be snug; if you can pinch harness webbing between your forefinger and thumb, it’s too loose. The harness retainer clip (plastic buckle) should be at the armpit level; this keeps the harness straps from slipping over the shoulders. Infant carriers MUST be installed in a reclined position (see manufacturer’s instructions) and in the rear seat away from frontal airbags. Forward facing seats – check the proper belt path. Remove heavy jackets and blankets before securing child in the harness. Place jacket or blanket over child to keep him or her warm. The Farmington Police Department has partnered with Safer New Mexico Now for many years. This partnership involves training our officers to be child safety seat technicians. This means they are highly trained on proper use of child restraints and installation. The Farmington Police Department, Safer New Mexico Now and the Farmington Fire Department host monthly car seat fitting stations at the fire station by the mall, located at 3800 English Road in Farmington. These fitting stations are appointment only events. Call Safer New Mexico Now at 1-505-332-7707 to schedule an appointment. The Farmington Police Department values the safety of all children, and therefore, is very aggressive on enforcing child seat laws. Below is the New Mexico Statute for child passenger restraints. In later segments of this blog, we will have videos of how to properly secure children in various types of child restraints. 66-7-369 Child passenger restraint; enforcement. A. A person shall not operate a passenger car, van or pickup truck in this state, except for an authorized emergency vehicle, public transportation or a school bus, unless all passengers less than eighteen years of age are properly restrained. (4) children seven years of age through twelve years of age shall be properly secured in a child passenger restraint device or by a seat belt. C. A child is properly secured in an adult seat belt when the lap belt properly fits across the child’s thighs and hips and not the abdomen. The shoulder strap shall cross the center of the child’s chest and not the neck, allowing the child to sit all the way back against the vehicle seat with knees bent over the seat edge. D. Failure to be secured by a child passenger restraint device, by a child booster seat or by a safety belt as required by this section shall not in any instance constitute fault or negligence and shall not limit or apportion damages. ← Suspicious behavior, what is it and how do I report it?